We conducted a mini study to identify whether load carriage has an effect on uphill skinning speed. Athletes were asked to ski up the same slope 2 times, once with a heavy but safe pack (25 lbs) and once with a light and fast pack (10 lbs). We determined athletes that participated in this study were on average 14.8% slower with the heavy but safe pack. When backcountry skiing, weight can be a burden. At least that is what we are led to believe by the outdoor industry. With a quick online search, one can find countless articles on how to pack for fast and light backcountry adventures. Often these lighter items are less durable and come at a higher cost. This mindset motivated us to ask, is leaving behind the satellite phone or first aid kit worth it for the sake of saving a couple pounds? Is the more expensive, lighter gear really worth the extra money? This study will focus on the skier who uses alpine touring bindings and skins on their skis specifically. 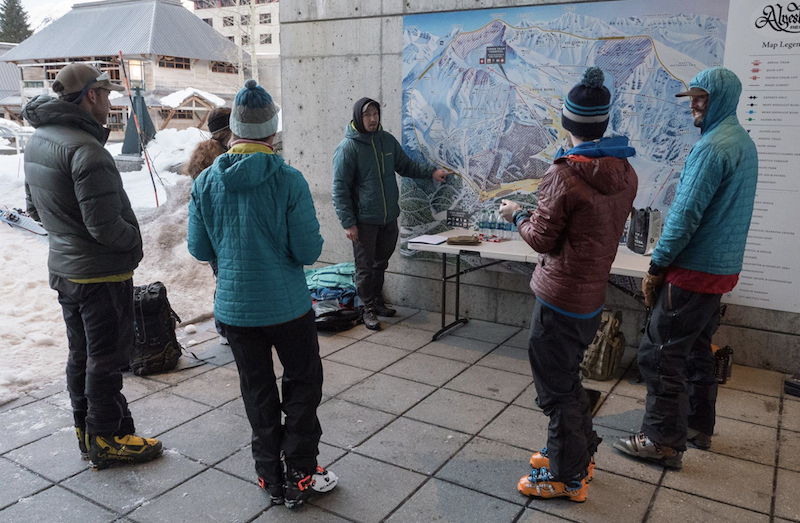 Within the backcountry skiing community, there are sub-groups. One of these is the professional, who may be a forecaster, educator, or guide. The contents of their pack will be very inclusive and usually contains a means of communication and an advanced first aid kit. An example of a heavy but safe ski professionals pack, PC Eeva Latosuo. Another sub-group of the community would be your typical recreational skier. This person may have taken an avalanche course, but they are strictly in the backcountry for a personal experience. Their pack probably includes less than the professional’s pack, but more than the third group option. The third sub-group are fast and light ski mountaineers. These are athletes who pack very intentionally, similar to the professionals, but purposefully leave out some equipment for the sake of weight and speed of travel. 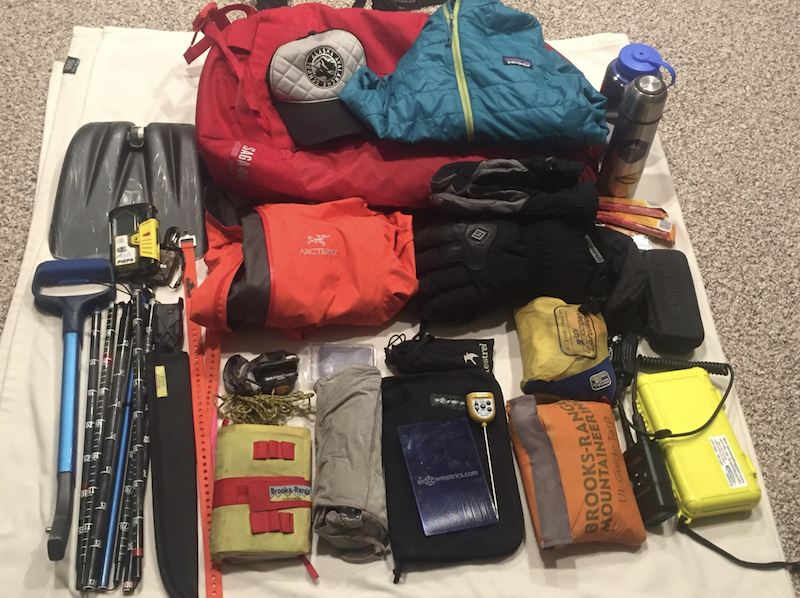 An example of a light and fast ski mountaineers pack, PC Alex Lee. “Skinning” is the act of traveling in the backcountry by using touring bindings, skis and skins. Skins are used by backcountry skiers to travel on flat ground or uphill. They are attached to the bottom of the ski with an adhesive that comes on the skin, which are removed prior to skiing downhill. The term “loaded” refers to the athlete’s pack and its contents, and that the skier will be carrying extra weight and gear while they travel. Unlike resort skiing, backcountry skiers need to bring layers, food, water, avalanche rescue gear, and other amenities with them. They carry these things in a backpack. 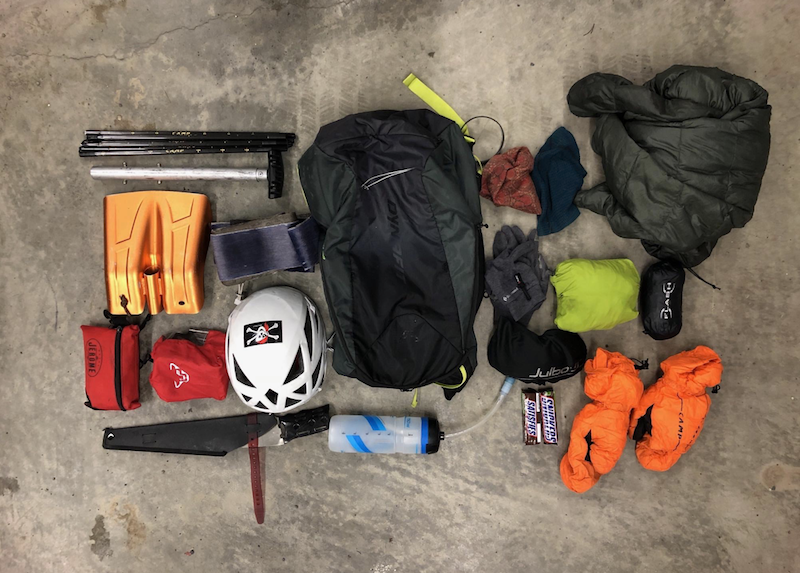 In order to standardize the “loaded” pack weights for both experiments, I used the contents found in typical backcountry ski packs. For the “heavy but safe pack” I used the contents found in an American Mountain Guides Association (AMGA) approved ski guide day pack. For the contents found in a “light and fast pack,” I assumed the bare-minimum equipment desired for backcountry skiing. The heavier pack will include avalanche rescue gear, repair kit, snow study kit, satellite phone, improvised rescue sled, improvised shelter, first aid kit, extra insulated layers, Gortex layers, warm hat, nutrition; including hot drink in a thermos and food, 1 liter of water in a Nalgene, fuel and stove. The light and fast pack will include a wind layer, warm hat, avalanche rescue equipment, goggles, snacks and 1 liter of water in a Nalgene. Pack- Black Diamond dawn patrol 15-liter pack, weight 2 lbs. For the sake of varying equipment, my control weights were 25 lbs for the heavy pack and 10 lbs for the light pack. While both packs tote avalanche rescue gear, only one is equipped for delayed rescue in case of an emergency. This is an important distinction for me specifically where I may be in remote Alaskan terrain and rescue can be hours out. I also took observations of my participants’ packs pack weights. An average weight of 16.56 lbs. A small, quick mini-study is a great tool for us to accomplish several things before conducting a larger, longer and more involved study. First, we tested the practicality and “churn” the testing protocols used in the study. Second, mini-study results can help us quickly identify obvious paths to follow with further research. Mini-Studies are the primary tool we deploy for MTI’s Mission Direct Research. The “mission-direct” emphasis of MTI’s research significantly impacts study design. Ideally, our mini-studies deploy elements which are practical and commonly used/experienced by our mountain and tactical athlete population. As well, ideally our mini studies are simple enough that the same study can be completed by others, without special equipment, techniques or expertise. In this study I used five volunteers, each with at least three seasons of backcountry skiing experience, with each season consisting of more than 20 days in the field. In this study we skinned uphill on a groomed trail at Alyeska Ski Resort. The two tests were conducted on the same day (2017-03-27). During both tests athletes were given heart rate monitors and asked to stay at 70% (+or- 5bpm) of their maximal heart rate for their age. Each athlete used the same HR monitor for both trials. Their actual fitness level was not taken into consideration. Weather and snow conditions have an effect on an athlete’s efficiency while skinning. To mitigate these effects, the tests were conducted on the same slope, trail, and skin track. The temperature was 21 ºF and the trials were conducted on the north side of Alyeska Ski Resort. The trail was not exposed to the sun during the trials and there was no precipitation on the days leading up to the trials or the day of the trials, and the sky was mostly clear. The trials began at 0800 and were completed by 1030. In this study we wanted to measure the effect a “loaded” heavy but safe pack had on a skier’s speed against a light and fast pack. We conducted the heavy trial first. The heavy pack weight was 25 lbs not including the weight of the actual pack. The trail used was approximately 1.25 miles in length with a 925’ elevation gain, the average slope angle was 14%, the snow was groomed the morning prior to the test. Grooming is done to improve the snow conditions. The light pack weight was 10 lbs not including the weight of the actual pack. The same trail and skin track was used. Each athlete was given a 10-minute rest upon skiing back to the start. One liter of water and access to Cliff energy chews were also given to each athlete. Question 2: Is this extra speed worth the decrease in safety? With this study I hoped to identify whether or not it is worth leaving potentially life-saving equipment behind for the sake of a lighter pack. 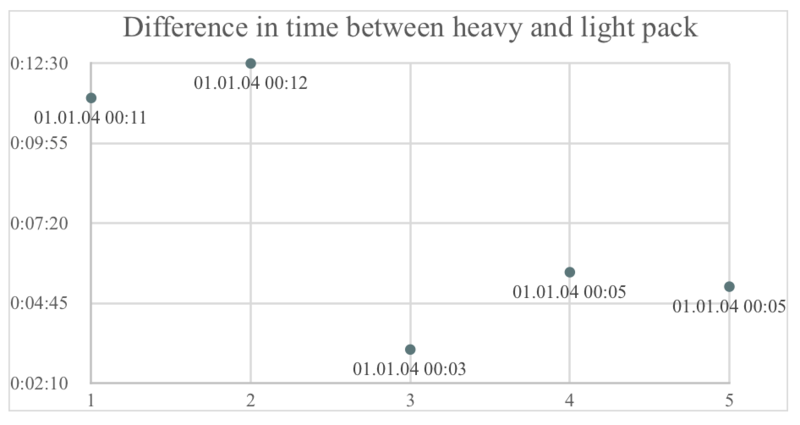 Assuming the difference in speed is significant between the heavy pack trial and the light pack trial. It depends. Here in Alaska backcountry access is incredibly easy, while the likelihood of getting caught in inclement weather is probable and rescue can be hard to come by. Are having items in your pack that could potentially elongate your survivability a necessity? We predicted that there would be no significant difference in skinning speed with the heavy pack vs. the light pack. I was wrong. The heavier pack did affect each athlete’s uphill skinning speed. Some more so than others. My statistical findings of p=0.01, conclude a significant difference does exist between the heavy pack trial and light pack trial. Skier 1 and 2 were 20% slower, skier 3 was 10% slower, skier 4 was 11% slower and skier 5 was 12% slower. This is an average of 14.8% slower. If your approach is an hour it is about 10 minutes slower while if your approach is 6 hours, it is an hour slower. Anecdotally, the athletes reported the heavier pack was holding them back from keeping their target heart rate, and that they had to constantly speed up to maintain target heart rate. While the opposite occurred with the light pack, the athletes reported that they had to slow down to maintain target heart rate. A t-test showed that there was a significant difference in skinning times based on pack weight. However, this test does not account for potential variations among individual skiers. Consequently, I performed a General Linear Model (GLM) test to examine the influence of pack weight and skier in predicting skin time. 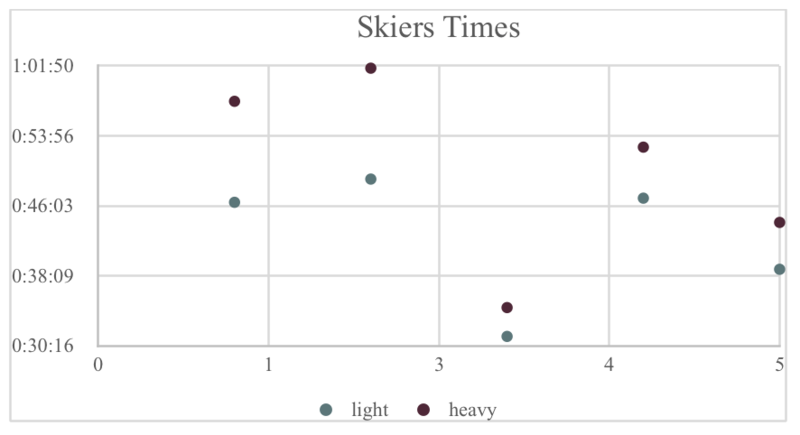 The GLM showed no influence of skier, pack weight, or skier:pack weight (interaction) in predicting skin time. Examination of this relationship likely suffered from the small sample size of this investigation. As such, increasing the samples size may improve predictive ability in future trials. Ultimately objectives should define what gear you bring with you, and while our study shows you will travel slower with a heavy pack its always safest to be prepared in the backcountry. If you consider exposure a hazard while ski touring, the light and fast pack limits the time you’re exposed and could be the safer pack. If I am doing a day trip and am expecting an hour or two approach I’d probably bring the heavier avalanche air bag and more contents. If I had a 6-hour approach I may still bring an avalanche air bag (if I’m lucky enough to have two different sizes) and pack a little lighter. Avalanche forecast and observations, the slope angle of the runs I intend on taking and weather would all have an influence on my decisions though. I could give you a hundred what if scenarios but ultimately having some sort of avalanche training and knowing the potential effect weight has on your approach time, should be factors in deciding how you pack. Group size, If the sample size were larger maybe inferential statistical models could show significance between the skier and weight. Both trials being on the same day. Running the heavy pack first could’ve lead to fatigue and caused the light pack trial to potentially be slower than it otherwise would’ve been. The “light and fast” trial could’ve been even faster than the “heavy but safe” trial, and the results could’ve showed a greater difference in speed. Potentially, taking observations such as age, gender, height, weight and fitness level could aid in inferential statistic’s given insight on to the relationship between skiers and pack weight. Does a higher level of physical fitness allow for a lower margin of difference in times? I did not test the physical fitness level of any of my volunteers prior to the test, however I do know 2 of them to have a high level of fitness. Skiers 3 and 5, skier 3 is an endurance athlete while skier 5 is a CrossFit athlete. Skiers 1, 2 and 4 do not subscribe to any fitness regimen. Would a greater distance traveled, or a steeper incline have a greater influence in times? The test was limited by the distance available to travel up slope. I assume if the slope continued at the same incline the gap between weights would continue to be much greater. Does the increased weight increase the risk for athletic injuries especially towards lighter athletes? This goes outside the realm of our research, but if were implying a backcountry skier take a heavier pack with them on their ski trips, a look into the impacts that weight has on the skier could be a factor on what someone brings with them. Is the extra weight worth the increase in exposure? Often while backcountry skiing exposure can be a hazard of its own. For example, traveling in avalanche terrain, beating an incoming storm back to the truck or traveling through an icefall on a glacier, your exposure time to all these hazards could be reduced with a light and fast pack. Is that speed worth the decrease in “safety” as far as the items you bring with you goes? Roy Wollgast is a 9 Navy veteran, holds a bachelor’s degree in Outdoor Studies from Alaska Pacific University and is an active CrossFit coach with 8 years of experience coaching. 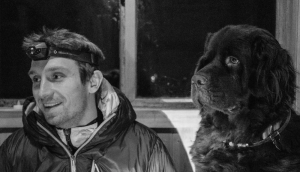 On his off time, he enjoys Alaska’s expansive backcountry by skiing, climbing and traversing some of the most remote terrain our country has to offer.